It’s been a while since we brought you a restoration job, and so, we decided to come back with a bang. The latest restoration post comes from R Deena’s garage in Mysore, who has shared the images of a Bajaj Chetak scooter that mimics the Vespa Super. However, while the Bajaj scooter draws inspiration from the Vespa, it retains the Bajaj logo. The Bajaj Chetak was restored and painted to mimic the styling of the Vespa Super. The hardware and engine have been left untouched. 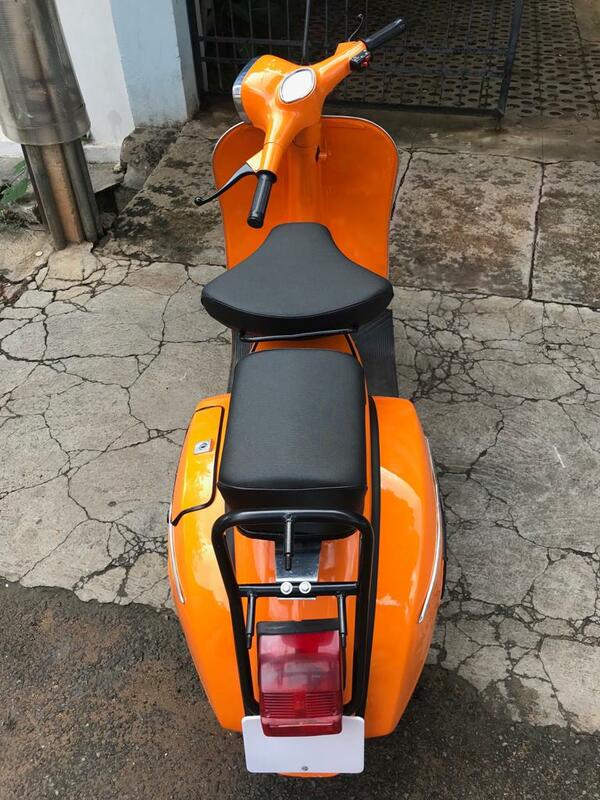 For starters, the rusted paint job from the original scooter was scrapped off, and it was given a bright orange shade for a refreshed look. R Deena opted for the orange shade as he has owned one in the same colour. The Chetak in the images is a rare find as it has the boxy headlight shape. Chrome bits on the headlight mask, fender garnishing, apron surrounds and body panel embellishment give a neat contrast to the package. The black colour of the vent and pillion footrest on the sides and bars at the back further enhance the looks of the scooter. The scooter retains the stock, analogue instrument console. The black dial merges well with the theme of the restored motorcycle. The new covers on the split style seats are perfectly re-done, making the scooter look just as good as new. 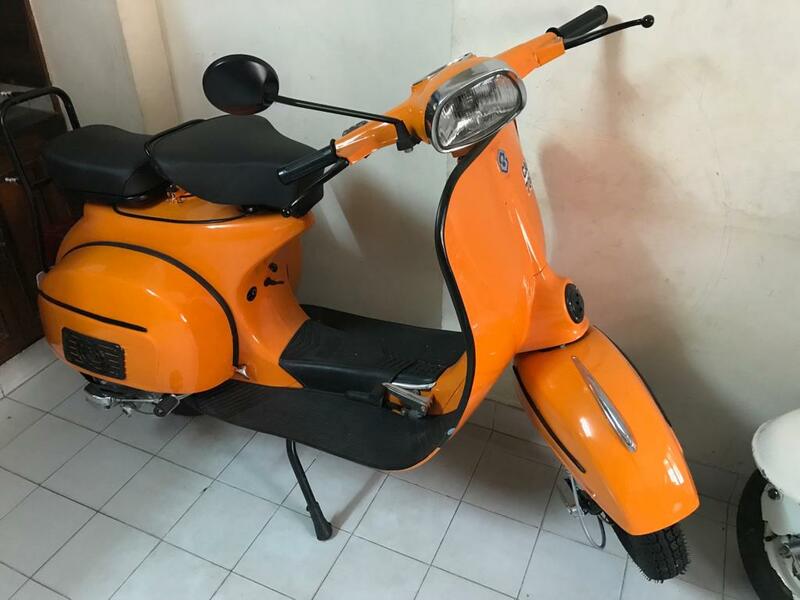 R Deena spent INR 5,000 to purchase the scooter in scrap condition (images in gallery) and invested another INR 30,000 to restore it. The complete restoration process took a month and a half to complete. The modified Chetak still has stock specifications. The 145 cc motor continues to use the standard bore from the factory specification. The two-stroke single-cylinder motor was tuned to produce 7.5 bhp at 5,500 rpm and 10.8 Nm of peak torque at 3,500 revs. This engine is mated to a four-speed transmission and allows the scooter to reach a top speed of 70 km/h, although the performance may have taken a toll by now. Stopping power comes from drum brakes on both wheels. The orange paint job is complemented by chrome highlights and black panels. The scooter was purchased for INR 5,000 in scrap condition and was restored for INR 30,000. It’s a fantastic restoration job, and R Deena deserves a round of applause for his work. To see your prized possession on Indian Autos Blog, write to us at suvil@indianautosblog.com.